What is glass mulch? This unique product made of recycled, tumbled glass is used in the landscape much like gravel or pebbles. However, the intense colors of glass mulch never fade and this durable mulch lasts nearly forever. Let’s learn more about using glass mulch in the landscape. What is Tumbled Glass Mulch? Glass mulch is a commonly used synthetic, or inorganic mulch. 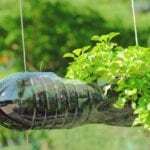 Using tumbled glass mulch made from used glass bottles, old windows and other glass products keeps glass out of the landfills. 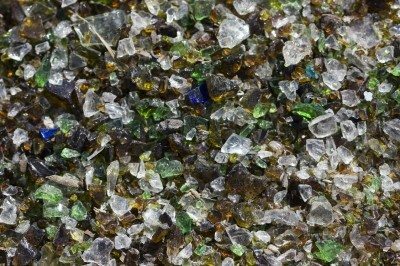 The ground, tumbled glass, which may display minor flaws common to recycled glass, is available in various shades of amber, blue, and green. Clear glass mulch is also available. Sizes range from very fine mulch to 2- to 6-inch rocks. Tumbled glass mulch has no jagged, sharp edges, which makes it useful for a variety of uses in the landscape, including pathways, fire pits or around potted plants. 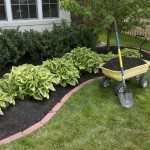 The mulch works well in beds or rock gardens filled with plants that tolerate rocky, sandy soil. Landscape cloth or black plastic placed under the glass keeps the mulch from working its way into the soil. Using landscape glass as mulch tends to be relatively expensive, but the low maintenance and longevity help balance the cost. As a general rule, 7 pounds of glass mulch is enough to cover 1 square foot to a depth of 1 inch. An area measuring 20 square feet requires about 280 pounds of glass mulch. However, the total amount depends on the size of the glass. Larger mulch measuring 1 to 2 inches or more usually requires at least twice as much to cover the ground effectively than smaller mulch. The expense is higher if the mulch is shipped. Look for glass mulch at retail building supply companies or nurseries, or contact landscape contractors in your area. In some areas, the mulch is available at the Department of Environmental Quality or city recycling facilities. Some municipalities offer recycled glass mulch to the public free of charge. However, choice of specific sizes and colors is usually limited.